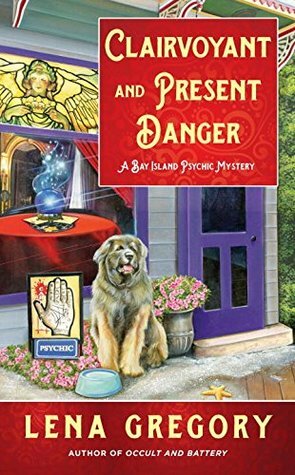 Clairvoyant and Present Danger was a fun cozy mystery, with just the right touch of paranormal for me. And a big bonus: a lovable dog who gets into a lot of trouble, making for some interesting times for the main character and her friends. What's not to love? First of all, the dog. I am not ashamed to admit that Beast was my favourite 'character' in this book. Although he is supposed to be a big dog, he comes across as lovable, oh so cuddly, and mischievous, and I certainly enjoyed his antics throughout the story. He made the story fun and interesting, and I was definitely curious as to what he would be up to next. Cass and Bee are certainly interesting characters as well. I adore Bee and love how he treats his friends, especially Cass, which makes the book all warm and fuzzy. I would definitely love to see more of him in future books, and look forward to knowing more about him. He just has that right touch of friendliness and sarcasm that warms my heart, but he's definitely not a pushover; his scenes whenever he thought Cass was interacting with a ghost were endearing and I liked him even more during those scenes. It's really nice to read a book where the main characters aren't always in conflict with each other. I really enjoyed the story, even if I thought the plot was a bit predictable. The writing was good and I certainly enjoyed the vivid portrayal of life by the beach, sitting in my cozy chair as it snowed yet again. It made me feel like I was right there, feeling the breezes on my face. I did enjoy the mystery, but I did think it was a bit slow as there was quite a bit of character development going on. I really liked the paranormal elements as they weren't overdone, and quite believable. I really liked that Cass doesn't quite believe in her own abilities, and is always startled and afraid when a ghost does show up at her door. Running out of her own house because she got spooked made me laugh and like her even more. There are quite a few moments I wasn't expecting which made the book fun to read; I definitely appreciated those twists. I just wish the twists were related more to the mystery than to Cass's life, but they were still fun to read. Clairvoyant and Present Danger is the third book in the series, and although I haven't read the first two, it certainly didn't matter when it came to the main story line and events. There is probably some background stuff I didn't fully understand, but I plan to read the others to discover a bit more about Cass and some of the situations in which she's been involved. I recommend this book to anyone who is looking for a lighter, interesting mystery with great and intriguing characters. And I look forward to seeing more Beast antics in future novels!!! You're welcome! And I am definitely looking forward to reading the first two in your series. I've really enjoyed the first two books and I am looking forward to reading this one as well. I haven't read the first two, but I did enjoy the characters in this one, and I am curious to discover more about them revealed in earlier books. Happy reading! I must look this one up. I love books with pets in them. I love the dog on the cover too. What a cutie! Looking forward to reading this book. Great review. Wonderful book. First books were really awesome and hope this will also be. Thanks for sharing with us. You're welcome! Hope you enjoy the book. I think that I'd really enjoy the mystical/psychic angle to this book. Of the cozy mysteries that I've read, that's something that seems a bit unique to me. Ms. Gregory seems like a fun storyteller, and Cass Donnovan sounds like a great heroine!